Hacking isn't just for geeks anymore. In this era of ubiquitous gadgetry and free information, anyone with a screwdriver can do a little unauthorized tinkering. Sure, the word hacking has negative connotations. But hacking is really about being a do-it-yourselfer. That means opening a Web browser rather than your wallet to get more functionality from the products you own. Without spending a dime, you can boost your processor's speed, give your graphics card a performance boost, increase your Wi-Fi range, or add sophisticated features to your old router. You can even beat the rising cost of energy by underclocking your CPU to a more modest, power-saving level. For other great hacks that will help you get more out of the tech you already own, check out "5 Cool Hacks for Your Entertainment Gadgets" and "6 Hacks for Your Mobile Gear." In the BIOS, adjust 'CPU Clock Ratio' or 'CPU Multiplier' to speed things up. With a bit of effort, you may be able to ratchet up your system's speed by 10 percent or more. Most CPUs ship with clock speeds set below their maximum possible settings, and they often provide a method for increasing that speed. Overclocking isn't very dangerous to your PC or difficult to do, but it'll likely void your warranty. While some off-the-shelf PCs can be overclocked, many can't; give yours a shot to see if it can. If your PC supports overclocking, you can bump up the speed in minutes. But to obtain the best performance and stability, set aside an afternoon to test different settings. Begin by gathering information. Look up your motherboard model, download its manual, and update its BIOS to the latest version. The maker of your motherboard likely offers an overclocking utility that you can run within Windows, but if you choose this method, the utility may need to launch within Windows upon every boot. Alternatively you can adjust settings directly in the BIOS; this approach will keep the system tuned until you change the settings again. Next, figure out how to access the BIOS and reset the machine to its default configuration if the upgrade becomes unstable (symptoms of which include application crashes and system freezes). Typically you enter the BIOS settings by pressing Delete or F1 as the system is booting; the PC's splash screen will likely prompt you. A reset, however, might require physically changing a jumper switch or pressing a button on the motherboard. Don't proceed without discovering this escape route; otherwise, you could lock up the computer without knowing how to get back to the BIOS. Additionally, research your CPU model online--you will likely find its part number listed in the BIOS--and record the temperature range that it supports. Successful overclocking requires that you compromise between performance and heat; if the CPU grows too hot, the PC will crash. Check the temperature in the BIOS as you progress. Sometimes the BIOS can overclock the CPU dynamically for you, through an 'AI' mode. If you have this option, it's all you need to use. But in most cases you tweak the CPU speed by ad­­justing the frontside-bus speed settings. 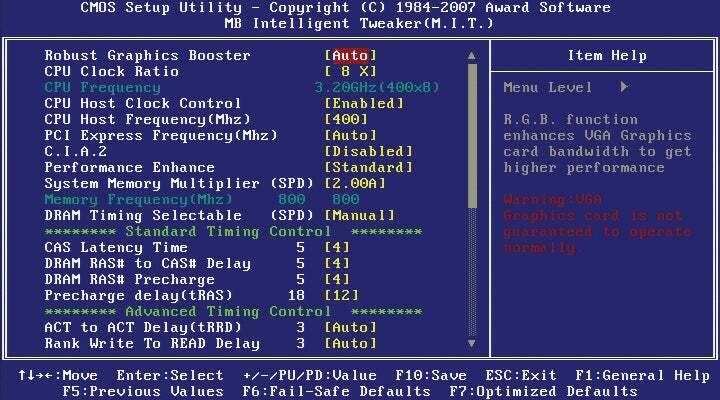 Within the BIOS, raise that value by 5-MHz or 10-MHz increments, save the changes, and then reboot. If your PC fails to boot completely--that is, into Windows--go back into the BIOS and return the bus speed to the previous setting. If it does boot successfully, restart it and repeat the process, incrementally raising the bus speed again. After you've made a few increases, run Prime95 for about a half-hour to exercise the CPU. If the system remains stable as this prime-number-generating software taxes the processor, continue to raise the frontside-bus speed slowly. If you notice performance problems and crashes, or if the CPU becomes too hot, back off the speed until you discover a stable setting. Consider upgrading your CPU's heat sink to keep it cool; a heftier heat sink can allow you to raise the bus speed a bit more.